I suppose it's fitting to talk about drinking water now that we are in India (due to the stigma attached with its cleanliness). In actuality clean drinking water from the tap is a concern in every country we have visited besides Australia, Singapore and debatably Malaysia and Hong Kong. That leaves 7 country so far and more to come where we've had to deal with the issue. The first solution everyone has is bottled water, but that posed at least 2 issues for us. First the cost, buying bottled water over 7 months quite frankly seemed like a waste of money. Second, and more importantly was the waste produced by the bottles. While the plastic is most certainly an issue in developed countries like the US, it's magnified by the lack of infrastructure to properly dispose of it (hopefully by recycling) in less developed nations. And while we are guilty of purchasing a bottle here and there as well as generating plenty of other trash, we tried to keep it as limited as possible where plastic was concerned. Our answer to the problem was a small gadget (of course who would I be without my gadgets) introduced to me by our friend Brian. 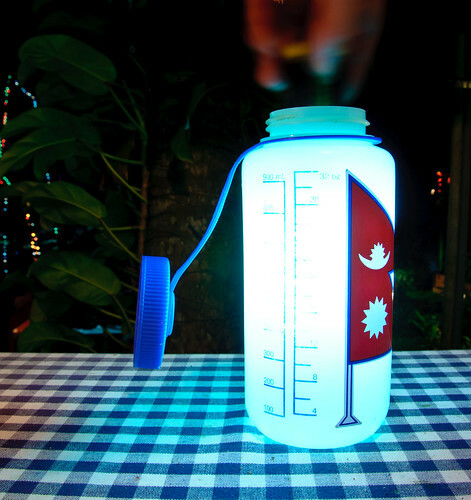 It's called a SteriPen, it uses UV light to kill both bacteria and viruses and everyone we've met was rather amazed by its seemingly magical capabilities, which is added to by the blue glow it emits in the water when it's on. The process is simple, fill a bottle with a liter of water (we are each carrying a Nalgene bottle) stir the SteriPen in the water for 90 seconds and drink. The process is fast and tasteless, unlike chlorine and iodine. While it does take batteries (which unfortunately pose another disposal issue) you can sterilize 50+ liters of water on a set. It is definitely high on our list of recommended travel accessories.